What is the difference between dry cleaning and steam cleaning carpets? Dry cleaning is a surface clean, which dries almost immediately, however will leave a sticky chemical residue. Steam cleaning is a more powerful deep clean system but can take a little longer to dry (still same day dry). Steam cleaning is the more thorough system, rinsing away the contaminants and cleaning solution. It is the method recommended by the Wool Marketing Authorities and all major carpet manufacturers. It is the only system recognized by the Australian /NZ standards as being the best restorative cleaning system. The method Alpine Carpet & Tile Cleaning use for cleaning is hot water extraction, commonly referred to as steam cleaning. Our exclusive hot water extraction method removes the toughest, deepest dirt safely and gently. Hot, soft water and a specially formulated cleaning solution are injected deep within the carpet fibres. Then, a powerful suction extracts deep-down dirt, allergens, cleaning solution and 95% of the moisture. It’s the cleaning method most recommended by carpet manufacturers. On average, it will take approximately 20 – 30 minutes per room. This time can vary greatly depending on the amount of furniture to be moved, how soiled the carpet is, and any necessary spot removal treatments. Dry time is affected by humidity, temperature and air flow to the area. It can take anywhere between 8-10 hours for the carpet to completely dry, depending on the aforementioned variables. Using fans in any rooms cleaned and turning your air conditioning or heating system on, depending on the time of year, can help accelerate drying time. You may walk on your carpet immediately after cleaning, but avoid wearing street shoes, as they may re-soil your carpet. We suggest wearing clean rubber soled shoes. Be especially careful when walking from damp, carpeted areas on to non-carpeted areas to avoid slipping. Yes we move most furniture, however we do not move heavy items like buffets, pianos, electronics, china cabinets, waterbeds, some large beds, dressers with mirrors, etc. There is no charge to move furniture and return it to its rightful place when cleaning is completed. We do suggest you remove items off your furniture like plants, lamps and knick-knacks. Do I need to vacuum before you arrive? A light vacuuming in the traffic areas is recommended. If needed, we can pre-vacuum the area to be cleaned. Also, the equipment is vacuuming the entire time we are cleaning. Why do prices vary with other carpet cleaners? When comparing prices, please bear in mind that we are professionally trained/certified, are fully insured with over 16 years of experience in the industry, have professional truck mounted equipment and offer a 100% satisfaction guarantee. Our price also includes full analysis/treatment of all spots/stains, free sanitizing and deodorizing, we don’t rush our work and we use furniture protectors and corner guards to look after your home and furnishings when using our cleaning equipment. There are also no hidden fees or additional charges. I have been told you shouldn’t use a hot water, truck mount system to clean wool carpets? This is an old wives tale. 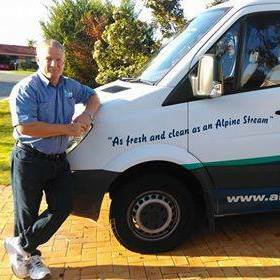 Wool Australia (www.wool.com) and the Australian/NZ Standards 3733 (www.carpetinstitute.com.au) recommend truck mounted, hot water extraction cleaning as the best way to clean and maintain your wool carpets, which is the method Alpine Carpet & Tile Cleaning use.